A festival on the banks of the Kankakee River in southern Porter County recently got a boost with state recognition for bringing attention to the history of an area of the county often overshadowed by the Indiana dunes. State Rep. Mike Aylesworth, R-Hebron, recognized the Kankakee Valley Historical Society for the 10th anniversary of the Aukiki River festival. 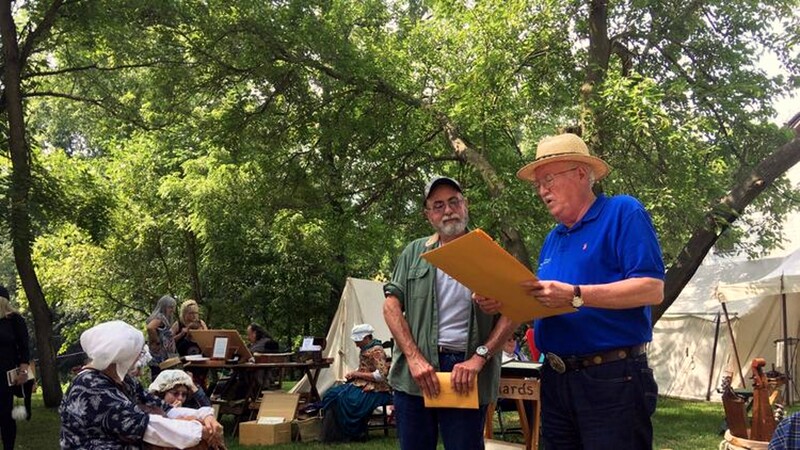 John Hodson, founder and president of the historical society, who leads the organization with his wife Mary, thanked Aylesworth for recognition of the festival, which has expanded from one day to two and encompasses historical reenactments of hundreds of years of life along the Kankakee River. The festival, he said, started as a way to spread the word about the area’s history. “We’re kind of the red-haired stepchild of the county,” Hodson said Saturday, the first day of the festival. “All the glory goes to the Dunes. Festival visitors and participants, some in period dress, sat on hay bales during the presentation while the sound of period shotguns being fired, one of the festival’s many demonstrations, occasionally punctuated the air. Festival attendance had already hit an all-time high by early afternoon, said retired veterinarian Larry McAfee, one of the festival’s many volunteers. Visitors asked re-enactors about the festival’s many time periods, which span from before 1600, when Native Americans lived in the area, through the 1940s. Terry Ireland of Kankakee, Ill., tended to beans and potatoes in a stockpot over a fire. A member of the Fort Tassinong Muzzleloaders, he’s been coming to the festival for four years. He gave a nod to the day’s sunny, mild weather, but that wasn’t the only thing he liked about the festival. Aylesworth said he’s been following the work of the historical society, which includes restoration of Collier Lodge and Linden Cabin, with avid interest. 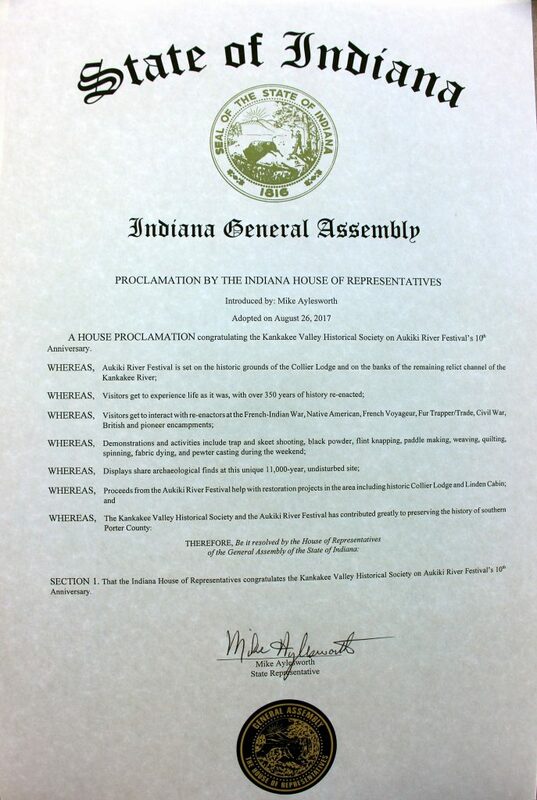 Aylesworth presented Hodson with a proclamation by the Indiana House of Representatives recognizing the festival; its activities; the archaeological significance of the site; the society’s restoration projects; and its contribution to preserving the history of southern Porter County. Hodson told Aylesworth he was “really impressed” by the recognition.